Twist 'em to push up more crayon. Easy to use, and no more peeled paper labels or broken crayons. Just like a regular crayon, except these twist up like a tube of lipstick. Great for kids who just can't resist peeling off the paper labels or breaking the crayon into pieces, these have a clear plastic outer tube that contains the crayon part. 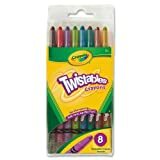 They give the same vibrant colors and are the same quality as regular Crayola crayons, though some users expressed their frustration that the larger tip makes coloring in narrow places difficult. Most users enjoy them as they prevent tiny pieces of crayon found being ground into the floor. Additionally, the longer shape may make them easier for kids to hold onto to. Plastic tubes contain crayon cylinders that can be twisted up and down, kinda like a tube of lipstick. The crayons have a fairly large tip, and are easy to grip. The plastic is clear so kids can see how much crayon they still have left in the tube. There are no refills available, so the plastic tube must be tossed or recycled once the crayon has been used up. Twist the plastic tube to expose more of the crayon tip. Most users really enjoyed this product. The durable plastic tube prevents kids from snapping the crayons into tiny pieces or peeling the paper labels off. With these, the crayons are used for coloring instead of just mess-making. Additionally, most kids don't seem to find these nearly as fun to chew on, so funky colored teeth are less of problem. Being twistables, these crayons never have to be sharpended, which is both good and bad. Most kids don't have any problem with the size of the crayon tips, but some users have mentioned that the larger size makes them difficult to fill in narrow places on a coloring sheet. Fine lines are also very hard to make. We suggest getting traditional crayons for older children or children who want precision coloring abilities. The crayon part can sometimes slide out of the plastic tube. If this happens, just slide the crayon part back in the tube and press down while screwing it back into the mechanism. Since the crayons are made of wax, doing this a number of times will likely just make the end of the end of the crayon into one large mess, so try to avoid over-twisting. Some kids will twist out more of the crayon than they actually need. This can cause the crayon part to break off and ends up wasting chunks of crayon. Because of this, we recommend supervising young children until they are able to tell how much they should twist out. Overall, these are good for kids who typically waste crayons by breaking them into pieces. We didn't find them to be any better than traditional crayons, and the larger tip makes them difficult to color in narrow areas. As with regular crayons, children still putting objects into their mouth should be supervised when using these. The pack comes with eight colored crayons. They come in a variety of basic colors, including red, orange, blue, green, and purple. Sets with larger numbers are also made by Crayola. We have no safety concerns for these, though we did note a number of users being frustrated with how these can't really be used for coloring in narrow spaces due to the larger crayon tip. Say goodbye to crayon sharpening and paper peeling. When tips wear down, just twist to expose more crayon. Crayons are more durable with better color transfer than regular crayons. Clear plastic barrels make it easy to see how much crayon is left. Package of eight includes red, yellow, blue, orange, violet, green, black and brown. Crayons are certified AP nontoxic.